DNA damage caused by smoking can be detected in cheek swabs, finds research published today in JAMA Oncology. The study provides evidence that smoking induces a general cancer program that is also present in cancers which aren't usually associated with it - including breast and gynaecological cancers. The research team, led by Professor Martin Widschwendter (UCL Institute for Women's Health and Dr Andrew Teschendorff (UCL Cancer Institute) looked at epigenetic alterations - changes to the DNA that switch genes on and off. Epigenetic changes are associated with cancer development and can be caused by exposure to environmental factors such as cigarette smoke. The researchers aimed to explore whether normal cells from the inside of the cheek would demonstrate epigenetic changes which are associated with lung and other epithelial cancers. These types of cancers originate in the epithelial cells - which cover the outside of the body as skin or the inside of the body as lining for organs and body cavities - and make up 85% of all cancer cases in the UK. The buccal cells taken from the cheek swabs are easy to collect and are directly exposed to cigarette smoke in those who smoke. To do this, in collaboration with Prof Diana Kuh (UCL Epidemiology & Public Health) and her team, they analysed buccal samples from 790 women all born in 1946 and 152 matched blood samples from the Medical Research Council National Survey of Health and Development. The dataset included information about smoking history and smoking status at the time the samples were collected. This analysis showed that buccal cells in women who have smoked had numerous changes to their epigenomes - known as DNA-methylation (DNAme). Buccal cells showed a 40-fold increase in abnormal methylation sites compared to matched blood samples, making them a more reliable indicator of DNA changes. 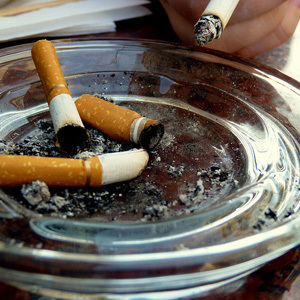 Smoking-related DNA damage to the epigenome of certain genes had been reversed in ex-smokers who had quit 10 years previously before sample collection, highlighting the key health benefits of quitting smoking. The team then went on to analyse this smoke-triggered epigenetic program in over 5000 tissue samples, including normal tissue, pre-cancerous tissue and cancer tissue from 15 different epithelial cancer types. In doing so, they tested whether they were able to discriminate normal tissue from cancerous tissue. They found that this program - which they originally derived in normal buccal cells of smokers - is able to discriminate between normal and cancerous tissue with almost 100% sensitivity and 100% specificity irrespective of the organ from which the cancer arose. Researchers also found that the absence or presence of this program was able to predict the fate of pre-invasive cancer lesions. The presence of the faulty program in the cells makes it very likely that a pre-invasive cancer will progress to a full-blown invasive cancer. However, the absence of the faulty program makes it likely that the pre-cancer can potentially regress and disappear. An individuals' DNA works like the hardware within a cell, with the epigenome being the software. Smoking misprograms the epigenome and the genetic code becomes difficult or impossible to read. Misprogramming of a cells' software, in conjunction with genetic mutations, eventually lead to an inability of these cells to develop into specific differentiated cells. These cells are then trapped in an undifferentiated status and can grow indefinitely and spread into other organs. Senior author Professor Martin Widschwendter said: "These are significant results for our core interest which is decoding women's cancers. We are a big step closer now to unravelling how environmental factors cause cancer. These results pave the way for other studies in which easily accessible cells can be used as proxies to highlight epigenetic changes that may indicate a risk of developing cancer at a site where cells are inaccessible. This is incredibly exciting for women's cancers such as ovary, breast and endometrial cancer where predicting the cancer risk is a big challenge." "The results also demonstrate that smoking-related DNA damage to the epigenome of certain genes had been reversed in ex-smokers who had quit 10 years previously before sample collection, highlighting the key health benefits of quitting smoking, or not taking it up at all." Athena Lamnisos, CEO of The Eve Appeal said: "We know that what's going to save most lives from gynaecological cancers is prevention - decoding why these cancers start and stopping them. That's why we fund research into the earlier diagnosis, risk prediction and prevention. This research shows how signs of developing cancer may be detected using accessible cells from inside the mouth. It points the way for pioneering further studies that will help detect women's cancers." Lead author Dr Andrew Teschendorff said: "Our work shows that smoking has a major impact on the epigenome of normal cells that are directly exposed to the carcinogen. Of particular significance is that these epigenetic changes are also seen in both smoking-related and non-smoking related cancers, pointing towards a universal cancer program. This research gets us closer to understanding the very first steps in carcinogenesis and in future may provide us with much-needed tests for risk prediction and early detection."